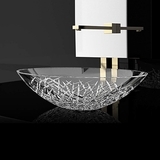 We like to think of bathroom sinks as the "eye candy" or the "jewels" of the bathroom. 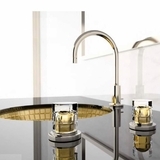 However, form and function are major contributing factors when selecting your sink. 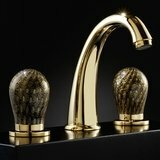 Whether the project is a simple bathroom remodel or has the complexity of a new build, before you select a sink, you must consider the following: how the sink material will influence the way the sink looks; how durable it will be; and how much maintenance it will require. So how do you go about choosing the right one? The first part to consider, is knowing what kinds of options are available. 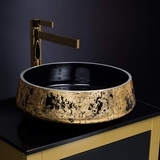 Sinks are no longer just a wash basin they've evolved quite extensively over the years. 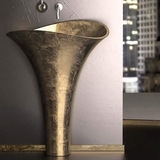 Sinks can range in all types of styles, colors, and designs. You must have the design concept or style before making your selection. The second part to consider, is understanding what your needs and preferences are and whether you're simply replacing an existing sink or doing complete bathroom renovation. Understanding your options, will help you select a material and get you a new sink you'll be satisfied with. For instance, let's use the comparison of aluminum vs. ceramic and evaluate the pros and cons for each one and will guide us in our decision making process. The advantages of aluminum alloy or metal sinks are another common vessel bathroom sink style. Aluminum sinks are a preferred style for contemporary design in residential bathrooms. They are effortless to clean, and cheaper to set up compared with the other styles. Aluminum sinks score highly in terms of usability and durability. They are impact resistant, and cannot be damaged by very hot or cold objects. Aluminum is more lightweight than other metals and is strong. Aluminum is also a great conductor of heat. It is also less expensive than stainless steel. The disadvantages of using aluminum is that they are more porous and prone to surface scratches and dent, which makes it a little harder to clean. The advantages of ceramic sinks have obviously been known for many years seeing as how they have been used in a types of design and are still used today. Ceramic type sinks are quite attractive and can come in a variety of colors to fit the design style of the buyer. They are also quite inexpensive as far as sinks go because metals, granite and other sink materials cost so much to obtain and fabricate sink shapes from, whereas ceramics are easier to work with in the manufacturing process. A final advantage of sinks made from ceramic materials is that they can usually be found just about anywhere. There are also many disadvantages to using them, and these are often exaggerated to the point that people avoid them on principle. One, of these is the tendency of ceramic materials to break or become damaged, which is slightly higher than that of metal or granite sinks. Another, disadvantage of ceramic sinks is that most of them do not look modern enough for many kitchen and bathroom designers today to consider using, but there are some manufactures that are an exception to the rule. 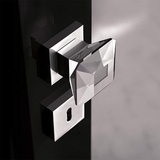 Contemporary or modern bathrooms seem to be the favored style among many designer's. 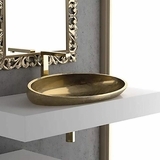 One component of modern bathroom design that can be a great balance to a small space is a raised or pedestal sink, often in angular, rounded or gently curving aluminum or perhaps porcelain. This efficient fixture choice can make a style statement while also acting as a space saver, as it doesn't require the sink to be set in a larger cabinet, allowing for an graceful and open effect.